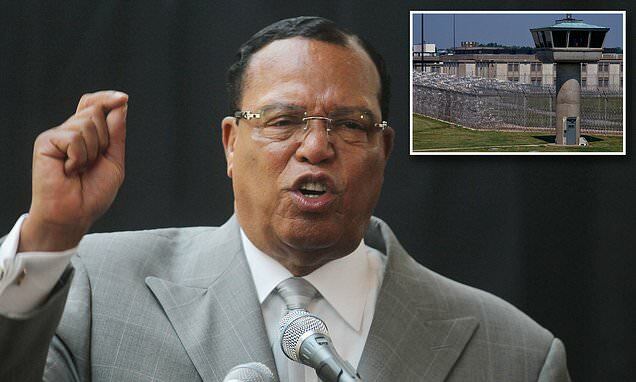 The Nation of Islam has received hundreds of thousands of dollars from the federal government in the past decade to teach religion to prison inmates, it has been revealed. Documents show that between fiscal years 2008 and 2019, the Chicago-based organization received at least $364,500 in contracts and awards from the U.S. Bureau of Prisons and the Justice Department (BOP), according to the Washington Examiner. Nation of Islam is the Louis Farrakhan-led Muslim organization that espouses black nationalism. BOP records indicate that the contracts were for ‘Nation of Islam religious services,’ ‘Nation of Islam spiritual guide services,’ ‘Nation of Islam study services,’ and other programs. The Bureau of Prisons declined to offer any details about the contracts. It refused to say what materials were used by the Nation of Islam in its teachings. ‘Contracts are retained six years after final payment, so we are not able to provide details regarding the original contract on which the Nation of Islam began contracting with the Bureau of Prisons,’ a BOP spokesperson said. Federal regulations stipulate that prisons ‘may contract with representatives of faith groups in the community to provide specific religious services which the chaplain cannot personally deliver due to, ordinarily, religious prescriptions or ecclesiastical constraints to which the chaplain adheres,’ the spokesperson said.